All-in ensembles: a mix of instruments, a mix of ages, a mix of skill levels with everybody welcome to squeeze up together and join in. They may be a whole heap of fun to be part of, but how does it feel to be the person standing in the middle, holding every thing together? 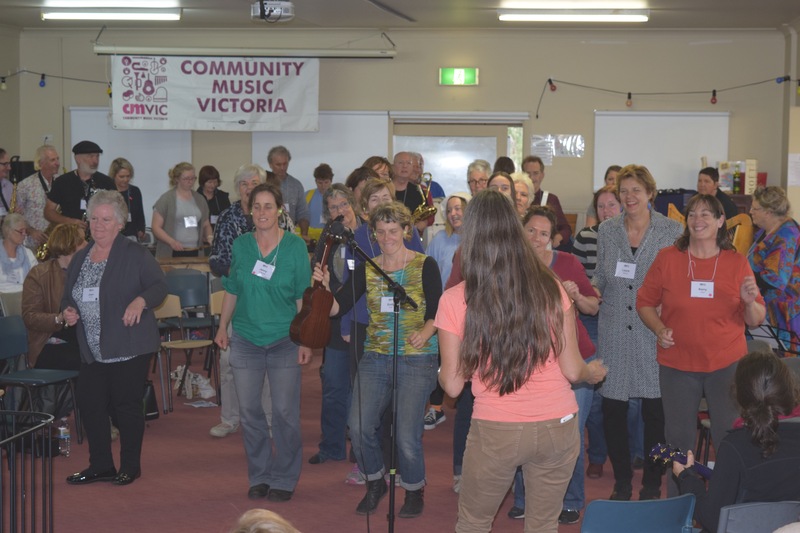 CMVic’s recent music camp featured a wonderful wealth of workshops for instruments and singers of diverse experience and skill levels. The all in ensemble, led by Lyndal Chambers, gave everyone the opportunity to come together and make music en glorious masse. Imagine being the facilitator. You’re stood among a squeeze of accordions, a swathe of strings, a blast of horns, a strum of ukuleles, and a chorus of voices, all keen, all excited to be a part of this amazing thing, this swelling of sound, all packed into a room with a fairly low ceiling, and all looking at you … Where do you start things off and how do you keep it all going? Even with a proven track record as a highly experienced music leader, facilitator and teacher, Lyndal admits the prospect of leading the 2016 CMVic ensemble made her nervous. 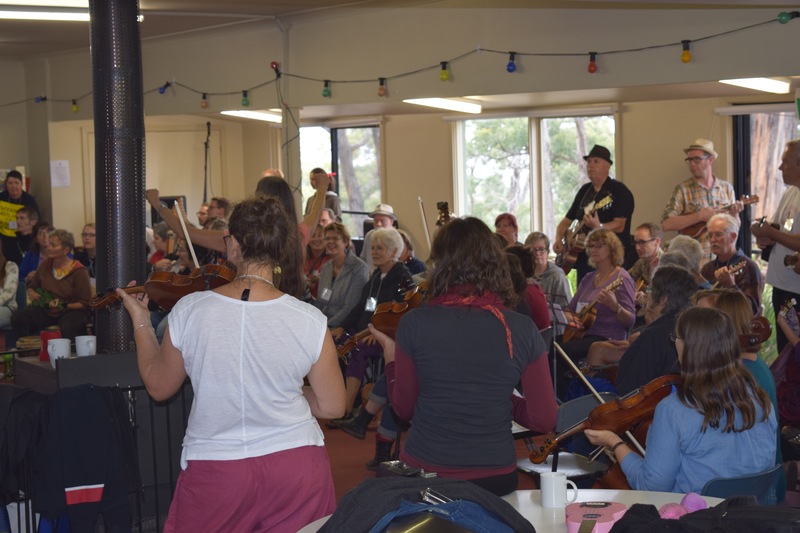 All Lyndal’s preparation payed off, and the ensemble at camp went with a swing on Saturday when everyone was full of beans and last thing on Sunday, too, when Lyndal pulled a fantastic second session out of the bag to end things on a high note. Lyndal used ‘Caderas’ (a traditional Balafon band tune) and ‘Coffee Love’, a song by Leanne Murphy and Frank Prem in four parts which worked for the singers and across the ranges of the instrument families too. In addressing the diversity of skill level and experience in a large group, Lyndal recommends the key to success is in keeping things simple. Coffee Love has two chords so Lyndal took her partner Strat’s ukulele and learnt those two chords from scratch. The process of doing this made her think that anyone else trying something for the first time would be able to join in with at least one chord or note of the tune. Lyndal also set the tempo and created a groove using clapping and dancing before starting on teaching the tune. How do you stay focused and keep everything together leading a group that size and diverse? Have faith in the group: they will be forgiving. If you have to think on your feet, that’s okay! Be mindful of the fact that everyone in the room is barracking for you and again, it will be okay! You will get to where you want to go and the group will cooperate and help you to get there. Once everyone’s cracked the tune, extend the musical experience. I threw it over to the group to answer these questions but at the back of my mind, I had those elements to fall back on to make it more interesting, more satisfying and to extend people’s musical experience. And so I think it’s about tapping into the people you’re working with. They bring skills and they bring cooperation. How does it sound? Take a listen here! And, above all, remember to enjoy the experience.